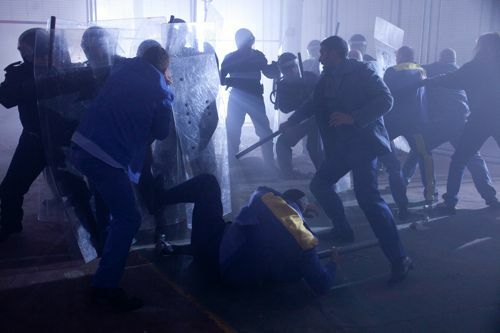 There’s a riot in Fenchurch Prison in Ashes To Ashes final series episode six. Written by James Payne, this is a dark, brooding and increasingly disturbing hour as we tumble towards the final two episodes. Including a tantalising glimpse of a scene from episode eight and more clues about what it all may mean. 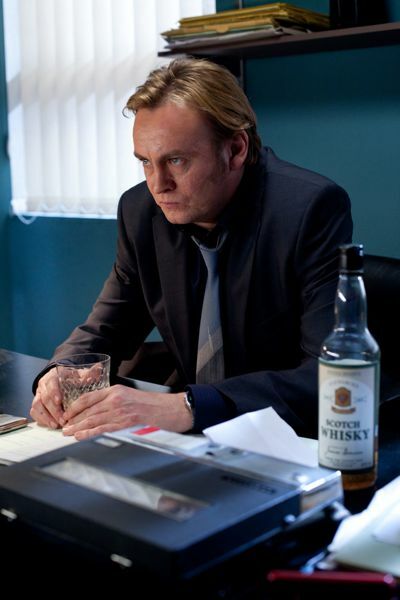 Gene Hunt (Philip Glenister) leads the first police charge into the prison but walks into an ambush. 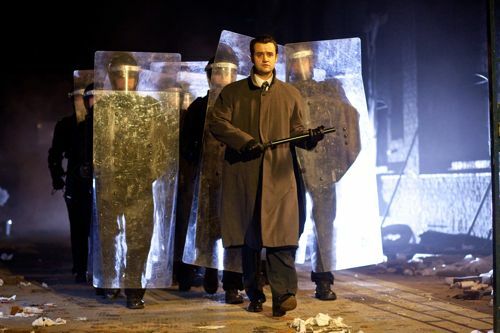 Leaving members of his team at serious risk from riot leader Jason Sacks, played by Stanley Townsend. This week’s Ashes includes what looks to be a potentially pivotal scene between Gene and Jim Keats (Daniel Mays). A possible explanation for those stars. And a major discovery for Alex (Keeley Hawes) in the final frames. In amongst it all, I spotted the exact same make of typewriter as the one I used in a Fleet Street newspaper office way back in 1983. There is something in this episode which did not sit well with me when I first watched it. But I warmed to it more on repeated viewings. There’s also a sadness at the knowledge that we are moving ever closer to saying goodbye to these characters. The story heading towards its end like sand in an hourglass. This is a powerful, sobering visit to Fenchurch East, with more shade than light. Paving the way for those final two episodes. Fans of a certain element of Ashes To Ashes should also pay full attention to the end titles teaser trail for next week. 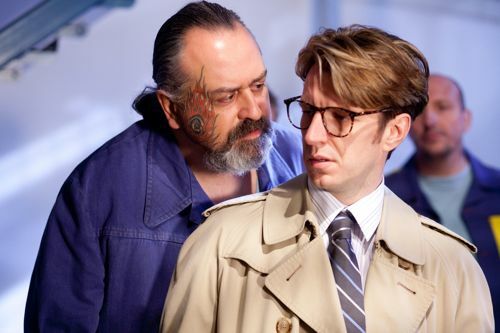 *Ashes To Ashes final series episode six is on BBC1 at 9pm on Friday. Posted in Ashes To Ashes and tagged Ashes To Ashes, Daniel Mays, Dean Andrews, Keeley Hawes, Marshall Lancaster, Montserrat Lombard, philip glenister. Bookmark the permalink. Ooh… this looks tantalizing, Ian, thanks! Thanks Nynke & Zoe. And Zoe – best if I don’t say either way. Sorry! Hi Zoe – answered via Twitter. But for the benefit of others, it was the very recognisable young Ben Elton, acknowledged as such by Alex, turning out to be someone else entirely. I certainly sense the darkness in this ep, and though usually I’d struggle with “angst” where there is none of the usual Ashes humour to offset it, I am looking forward to this one immensely, regardless…probably because last episode, as you rightly said, was blimmin’ brilliant, and there were several VERY dark moments in that, like the jacket incineration, and the Genesis-Mama scene which was absolute perfection…so I’m all ready for more dark stuff…I even relish the thought of it, which is a first! I’m also especially excited at your mention of ep7’s teaser trails, regarding a certain element of Ashes…and am trying not to let myself get my hopes up as to what this could mean…but my head/heart is already jumping to conclusions! Thanks Charlie. Yes, I remain a big fan of ep 5. Episode 6 is different but I still enjoyed it – if that’s the right word to use. It contains some powerful scenes which move the series on to where it needs to be ahead of 7 & 8. Sounds like the Railway Arms pre-ep 7 thread could be rather busy from Friday at 10pm. Let’s hope that our friends working the publicity mill have a heart. thank you, ian wylie, for giving joy to ashes fans around the world with your fabulous blog! ooh i can’t wait for a darker episode! with everything that needs to be resolved (and hopefully will be), it seems inevitable the mood should darken even more than it already has. also, was the “classic piece of misdirection” you mentioned in ep 5 about the comedian who we were meant to (maybe) think was a real person (i’d never heard of ben elton), but then (maybe) wasn’t supposed to be? or something else? sorry if that question makes no sense or has already been asked! Thank you Molly. And it was “something else”. Loved the not so subtle dig at the way the US version handled the LoM ending, “what do they think we are, astronauts” bit in ep. 5, BUT things do seem to be pointing in the way of an alternate reality type of ending as well. Certainly hope this is not the case. Felt the US cheapened their retelling with the ending as as it was. LoM and A2A is some of the best programmes I have seen in ages…. really hoping for a shocking conclusion. Thanks for another update. I’m not sure I like it being so dark…ok, I do, but it’s not good for my nerves, put it that way. Brain rapidly jumping to conclusions about the teaser trailer…wondering if I can fast forward life by about 30 hours to find out!! I’m hoping it’s Galex but don’t want to build it up only to then be disappointed. Could i last two weeks..? Actually me again….There is something that is not sitting quite right with me …and sitting here trying (in vain) to get on the railway arms…. The phrase “Collateral damage” by Jim Keats ….that to me on first viewing is very very ODD…. Hey, Ian…I just watched episode 6 for a second time and I still can’t work out which bit didn’t sit right with you. What was it? Haven’t posted on here for a long while however after last nights episode i feel compelled to do so. Firstly i was a massive life on mars fan and i wasn’t a huge fan of the first series of ashes. However i really enjoyed the darker more series side to the second series and have continued to enjoy the third. The writers though appear to have raised the bar even higher in the last two or three episodes. Last nights was seriously mindblowing, and i see exactly what the writers mean when they say Mars bleeds into ashes. I can only hope the final two episodes match the standard of the last couple. Also i’ve always believed Gene to be a gurdian type of angel protecting people’s souls and letting them live in a world in which they are happy and content (whether they are really back in time/in purgatory/or in heaven i’ve no idea). Firstly Morgan- and now Keats- have represented the devil and have tried to steal people’s souls and return them to a place where they are unhappy. Now my theory may be completey wrong, however i’ve yet to see anything which to me would suggest an obviuos alternative. Anyway i’m really pleased to say that for me this series is living up to and even exceding my expectations and i hope the final two episodes will match the quality of the last two. Harriet – in a word…Thordy. I found this episode absolutely incredible, I was left in emotional turmoil – the photo, Viv, Gene/Jim’s ‘battle’ for Viv etc, it all just blew me away. Can’t wait for next week! Ian – when will you post your thoughts on episode 7? Helena – depending on other work, poss later today. Was very happy to see that punch-up (Gene v Thordey) last night. I thought Gene was getting too soft, how wrong I was !! Not sure why Thordey was saying he was Sam, anyone who’s watched LoM knows he so is not. He looked nothing like him !! I sat there thinking “he must really luv that show!”. If he *is* meant to be a really old Sam, (which I doubt) why would he say he wanted to die ?? Wasn’t wanting to be there one of the reasons he killed himself in the 1st place ?? Looking forward to (maybe wrong choice of words ??) to 2-part finale – doubt I’ll be as emotionally involved with a tv series again. Also, you said you thought there was a possible explanation for the stars…did I miss something? I didn’t think anything was concluded? It’s in there somewhere, Harriet. Nothing conclusive just one possible explanation. Is it just me or has anyone else noticed how much s3 has a ton of night time scenes! For some reason that just really has my mind wondering if there is significance to that or it is just my over theorizing brain due to being a Lost fan. I didn’t cry at the end because I was far more intrigued with what was going on between Keats and Gene. Along with friend pointing out that is also interesting in the way Keats holds the person who is dying as well. Am totally confused and intrigued..its very similar to the last book scene of ‘The last battle of Narnia’ where the world slowly is stripped away leaving just the stars , ready for the start of a new world ..I want to know why Gene doesn’t see the stars ? We don’t hear about Molly any more , Alex’s overriding concern was to get back to her and earlier in the series Alex mentions that she wants to stay.. is she perhaps dead in our world ?.Sam Tyler s desire to return to this parallel world by any means and yet … can’t wait for Friday ..